Proswim Awards & Testimonials, recognition of great service. 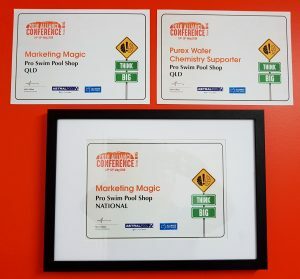 2018: Proswim picked up 3 awards in 2 categories at this years Conference in Uluru! 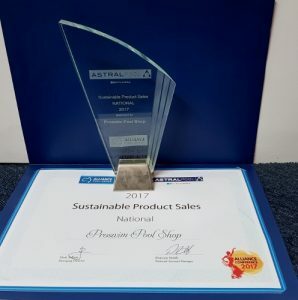 2017: Proswim won the National Sustainability award! The Awards night was in Barcelona Spain!! 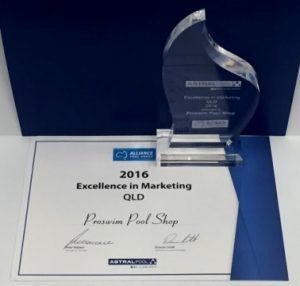 2016: Proswim won the Queensland award for Excellence in Marketing! 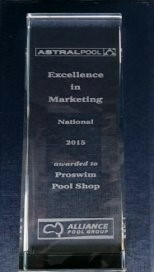 2015: Proswim won the National award for Excellence in Marketing! 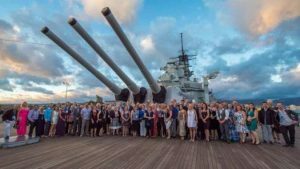 The Awards Night was on the deck of the USS Missouri at Pearl Harbour!!! 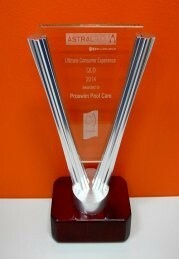 2014: Proswim won the Queensland award for Ultimate Consumer Experience! Thank you and your staff for looking after us over the last 21 years. The time has arrived for us to sell up and move on. We have sold our house and the sale settles on 22/3/19. Would you arrange to have a final service carried out for us on 21/3/19, I noticed that the little spring loaded catch on the skimmer box lid was broken during the last service, would you have your guy to replace it on Thursday. I will leave your details for the new owners. I just wanted to say thank you as the cleaner turned up today-that’s incredibly quick service. I’ve just put the cleaner in the pool and it is so much better than the Zodiac we were using-it has absolutely no problems with the gum nuts and will definitely save me a lot of vacuuming! Thank you again-it’s a pleasure buying from somewhere where the service is so good. Today we had the new filter and chlorinator fitted by Matt and Nick and we would like to pass on to you our complete satisfaction in the most professional way these two guys went about their business. If the new equipment works as good as Matt and Nick and as good as they say it will, then you will have an ongoing satisfied customer for many moons to come. NB Please don’t tell them I have given them a wrap as they will only get swelled heads. Our son Mark is aware if he needs anything whilst we are away, he is to call you guys or call into your shop and we will either pay the invoice when we get it or at the very least, upon our return. Can you please cease the service agreement and ongoing work. The new owners are settling on 11/8/16 we will pass your details with a great recommendation. May be worth following them up post settlement if you don’t hear from them. Thanks for all of your great service. I would like to advise that we will no longer require your services at this address. My mother, Betty, is now 94, and my husband and I have had to take the decision to move in with her, to continue to provide her with intensive care in the final years of her life. My husband has a good knowledge of pool maintenance requirements, and is able to manage this issue at this time. However, we would like to take this opportunity to thank you for the many years of kind and dedicated service you have provided to my mother and father. It has not gone unnoticed or unappreciated. May I take this opportunity also to wish you and your staff all the very best for a Happy and Prosperous 2016. Ive never owned a pool before so I was a little apprehensive about where to start. Proswim were the first company to come around and quote. They gave me the most honest customer service I’ve had in years. The staff are friendly and I was given so much information to help me maintain my pool. I would recommend this company to anyone. First Class Customer Service 5 Stars. I run a 40 house Body Corp complex. It have had the pleasure of deal…ing with Michael, owner of Proswim. Anyone who wishes to deal with what I’ve consider to be the best and ethical company with that long forgotten personal touch, please call Michael from Proswim. They supply all our requirements for our community pool and always are there for me with any enquiry when I need help, going to every effort to find the item they don’t deal with. Thanks so much Michael for being the best and for the new echo pumps. You said they would be a power saver. Wow! Spot on. Great guy. Great company. Pleasure dealing with you.. Thanks Michael that sounds good. On a side note, it has been a pleasure dealing with Proswim over the past few years. We had countless other problems with other local pool shops during the past 4 years, Pool***x at S*****pine being the worst. The owner is a d***set th**f.
Proswim are quick, professional & kept the pool in the best shape it’s been in as the blackspot has never returned since you started servicing it. Just wanted to let you know the Rebel we purchased during the week is working brilliantly. No problems in setting it up, and no teething problems experienced since it was installed. Will definitely be recommending this over any other type of pool cleaner we’ve used for the last 15 years. Cheers guys, have a good weekend. I just wanted to thank you for your amazing service. I received the pool tyres the next day (all the way from QLD!) and was very impressed. You were also the cheapest store on the internet for this product. Couldn’t be happier! Just a short note, to Thank you for your prompt service and delivery of the Autochlor RP25T. I received it yesterday and had it up and running in an hour. Just dropping you a line to say the Austral guys came out and replaced the leaking cell. Prompt, courteous and no fuss. I have been really impressed with both yourself and Austral in taking care of this for me. To my mind it’s the after purchase service which defines and excellent supplier from the rest. As the saying goes: “anyone can sell a product to many customers but only the best can continue to sell many products to the same customers”. The service, knowledge and professionalism exhibited by Proswim has been excellent since I first walked into your shop and its excellent to see you’re backed by quality products and suppliers who stand by them. This is why I literally drive past 4 pools supply shops to do business with you guys. Hey Michael, just letting you know the skimmer socks you sent me are easily the best I have ever used… thanks heaps, Greg. Got the pool cleaner today! Absolutely brilliant! Already installed and cleaning the pool as we speak. Thank you very much for your prompt service. Ordered Saturday, sent Monday and delivered by courier midday in Sydney. Well Done!! Thanks for prompt and excellent service which is much appreciated. The TPC is working great and pool is sparkling! Best wishes for a Merry Christmas and 2014 blessed with Good Health, Great Prosperity and Success, Peace and Good Fortune. “I have been to many pool shops but hadn’t found one that wasn’t trying to rip me off or could solve my problems or provide the services that I needed, until I found Proswim. These guys are a pleasure to deal with.” Sharon from Bracken Ridge. “I go away for weeks at a time with work and all my wife has to do is call Proswim if she has any problems.” Greg from Sandgate. ” Proswim has been looking after our units block pool now for years. We tried some of the franchised pool companies but found them to not only be more expemsive but they didn’t really seem to know what they were doing.” Grace from Clayfield. “I live at Morayfield and make the trip down to Bracken Ridge to get my water tested, it’s worth the drive because I know that they will look after me.” Mark from Morayfield. Thanks for yesterday’s delivery of two drums of chlorine. As I was lifting one of the drums (the fairly newish one) some chlorine leaked out down my leg. All is well with me ( I just swished the leg around in the water of the pool to ensure there was no problem) but the drum has a split in its side. The pool badly needed the chlorine as it was starting to go cloudy so I poured the whole 20litres in. As a result I now require (on your nexr delivery run say TWO more drums of Chlorine AND a new cap tap and seal as there is also a leak around the cap when pouring the chlorine. Cheers for now and THANKS FOR THE GREAT SERVICE YOU ALWAYS PROVIDE. Thanks for doing such a great job with our pool at 21 Kennedy Street, Brighton. Our current tenants are moving out on the 7th May. At this stage we do not have new tenants. as no one will be using it. Then before the new tenants move in clean it all up and teach them how to use it. Hopefully we will have tenants move in shortly after the 7th May and this will not be an issue. for the first 3 months and then once every 3 months after that. It might even arrive on the Couriers Please afternoon run late this afternoon, otherwise I’ll probably see it in the morning. Also received the emailed receipt.